The tomb of Tutankhamun contained four gilded shrines nested one inside the other in order of decreasing size. Inside the innermost shrine was a red quartzite sarcophagus which protected three anthropoid coffins (man-shaped) which were all painted with the likeness of Tutankhamun. These paintings were extremely important as they provided the dead with a face in the afterlife. The first two coffins were made of gilded wood but the final coffin was made of solid gold. The solid gold coffin housed the mummy of King Tut and his fabulous golden death mask. This page describes the King Tut Coffins. The King Tut coffin was not just one coffin it was a series of three coffins which were encased in a large quartzite sarcophagus, which had in turn, been placed in a series of four shrines. The Shrines and the Tutankhamun Sarcophagus protected the gilded wooden coffins which were snugly nested within each other, like Russian dolls. The final coffin was made of solid gold containing the mummy of the Pharaoh Tutankhamun. The mummy of King Tut was directly covered by his fabulous golden death mask. The coffins are described as Anthropoid meaning man-shaped. The term anthropoid coffin is therefore used for coffins made in the shape of a human. The golden series of the first two anthropoid coffins, shaped as a human, were made of gilded wood and decorated with beautiful faience. The faience used by the Ancient Egyptians was a strong greenish blue glass-like material, consisting of crushed quartz, lime and alkali. The gilded wood consisted of cedar and some oak. Gilding was used by the Ancient Egyptians to achieve a wonderful golden appearance. The base wood was covered with a thin sheet of gold, a thicker than normal gold foil of sheeting was used for the coffin layers of Tutankhamun. 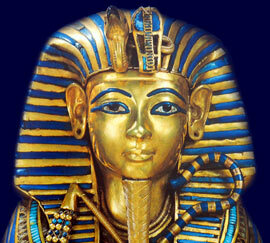 The final coffin was made of solid gold which housed the mummy of King Tut and his fabulous golden death mask. Tutankhamun is represented on the man-shaped coffins in imitation of the god Osiris wearing the traditional false beard and the headdress of the pharaoh called the nemes. The nemes was a striped head cloth worn tight across the forehead with lappets falling forward over each shoulder. The top of the nemes displays the uraeus (rearing cobra emblem) and the vulture on the brow which were emblems of the deities Wadjet and Nekhbet of Upper and Lower Egypt. Both arms are folded as the sign of the King of Egypt and he holds the royal insignia of the crook and the flail in each hand. The body was engraved with feathers and the figures Isis and Nephthys together with the figures of Nekhebet and Buto, emblems of upper and lower Egypt. The inlay of the coffin was of semi precious stones. There was also a detachable necklace made of gold and faience. Each section of this website addresses all topics and provides interesting facts and information about the Golden Age of Pharaohs and of Egypt. The Sitemap provides full details of all of the information and facts provided about the fascinating subject of the Pharaoh Tutankhamun.